To prevent fraud and evasion of immigration laws, the United States Citizenship and Immigration Services (“USCIS”) will grant permanent resident status for only two years if a couple has been married less than two years at the time that residence is granted. This type of residency is considered conditional permanent residency. A foreign national with conditional permanent residence must file a petition along with supporting documentation requesting that USCIS remove the conditions from his or her permanent residency and convert the immigration status to permanent resident (with no conditions). The petition to remove conditions must be filed within 90 days of the expiration of the conditional permanent resident card or “green card”. Failure to file the petition to remove conditions may result in the termination of lawful status in the US and the initiation of deportation proceedings. Foreign national was granted permanent residency as an alien entrepreneur or investor. The process and requirements to remove conditions differs on the status of the marriage through which conditional residence was granted. Having a skilled immigration attorney can significantly improve chances of success in having conditions removed. Improper or untimely filing of a petition can significantly delay your case and even result in deportation from the United States. Have you or your spouse been granted conditional permanent residence? It is imperative to have an experienced attorney assist you in this time sensitive process. The Texas immigration attorneys at The Law Office of Kathryn N. Karam, P.C. serve numerous communities in Galveston County, Brazoria County, Fort Bend County, Harris County, and Montgomery County. You can receive a complete evaluation of your case by calling (832) 582-0620 right now to take advantage of a confidential consultation. What is the process to have conditions removed a green card? What requirements must be satisfied to remove conditions? What evidence must be submitted with the petition to remove conditions? How do I apply for an I-751 waiver? To remove conditions from a green card, the conditional resident must file a Form I-751, Petition to Remove Conditions of Residence with USCIS. The petition must be “jointly filed” or filed by both spouses. The conditional resident may include his or her children, who received conditional residence at the same time or within 90 days, in the petition. Children who received conditional residency more than 90 days after the qualify spouse must file a separate petition to remove conditions. After USCIS receives the I-751 petition, it will issue a receipt. The receipt automatically extends permanent resident status for up to one year. It is important that the conditional resident retain the receipt as proof of lawful status in the U.S.
USCIS will also send a biometric appointment notice. This notice provides a date (or set of dates), on which the conditional resident must appear at a designated facility for fingerprinting. USCIS will process the fingerprints and conduct a background check. If USCIS determines there is a reason to question the validity of the marriage, it will schedule an interview. The purpose of the interview is to ensure the marriage was not entered for the purpose of evading immigration law or conferring an immigration benefit. Following the interview, USCIS mails a written decision regarding the I-751 petition. Should USCIS intent to deny the petition, it must send a Notice of Intent to Deny (“NOID”). The NOID will contain a series of allegations regarding the validity of the marriage. The conditional resident is given an opportunity to rebut the allegations. If USCIS is not satisfied with the rebuttal evidence, it will deny the application. There is no appeal. Both spouses must jointly petition for the removal of conditions. Should a conditional resident not satisfy all of the aforementioned requirements, he or she may apply for a waiver of the joint filing requirement. In order to remove conditions from a green card, the conditional residence must provide proof of a bona fide or valid marriage. The supporting documentation should cover the date of conditional residence to date of filing the I-751 petition. Apartment lease or mortgage statement of property jointly occupied. The conditional resident or children will experience extreme hardship if they cannot remain in the United States. Supporting documentation must be filed with the I-751 waiver. The documentation necessary to satisfy waiver requirements vary depending on the grounds the conditional resident is seeking the waiver. It imperative to contact an experienced immigration lawyer when preparing the waiver petition. When seeking to remove conditions from a lawful permanent resident card or green card, it is best to consult experienced legal counsel. 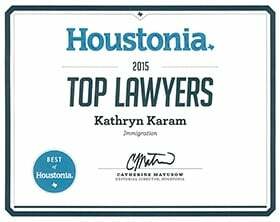 Kathryn Karam is a Board Certified in Immigration and Nationality Lawyer designated by the Texas Board of Legal Specialization. The Harris County immigration attorneys at The Law Office of Kathryn N. Karam, P.C. represent clients all over the Greater Houston area and are fluent in Spanish, Cantonese, and Mandarin Chinese. We can review your case as soon as you call (832) 582-0620 to set up a confidential initial consultation.